Hello! How's the holiday shopping and prepping going? Let's take a detour today from all the Christmas frenzy, shall we? How about a design/decor feature? Ambient lighting sets the mood for a cozy evening at home - Deepa's formal living room. Shalini of all things nice (remember her fabulous home?) invited me to be a part of this interesting series she is hosting on her blog. She has asked a bunch of us bloggers to put together a list of what we consider design must-have's for our homes (a list of five design essentials). 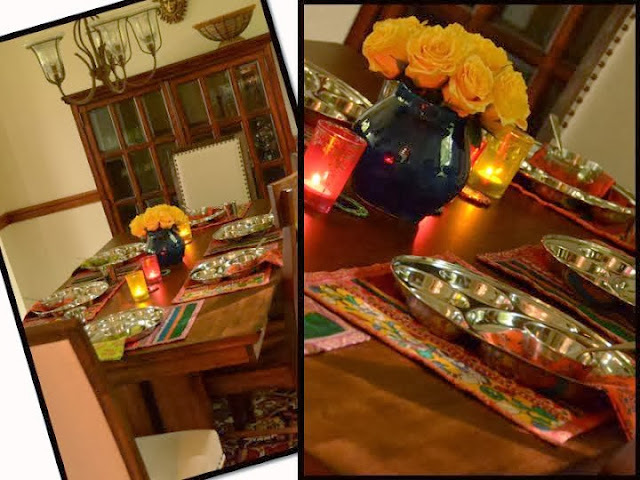 This series titled Design Blogger's Fab Five for the Home will air on Shalini's blog throughout December. So, make sure to grab your cup of coffee and tune in to All things nice regularly-'coz she's featuring All Things Nice! Thank you Shalini for the invitation to contribute. I have never really considered myself a "Design Blogger" and to be awarded this distinction by a blogging peer is humbling in itself. Also, to be included in a club of elite bloggers is truly an honor! Muchas Gracias! We at Aalayam, love working with other bloggers to bring resourceful posts to our readers and therefore, thank you! While you are there, be sure to check out the first installment in this series from Bhavna of an Indian Summer- what a great list! Today, Shalini is featuring my must-have list. And, here is a sneak peek (well, I couldn't stop at five. I couldn't - it was simply too hard! So, I gave her six!). "Form or function - how about both? And I am talking furniture! You can never go wrong by investing in furniture pieces that are enduring, functionally sound and aesthetically appealing!" I believe comfort and functionality are as important as the ornamentation, do you? Find out what I cannot live without when it comes to decor and design over at Shalini's. Kudos to Shalini for this initiative! What a great way to compile inspirational ideas for your home. Make sure to bookmark the series and share your thoughts with us. We love your feedback! It's almost time to draw the curtains on 2013 and it has been a wonderful ride so far for Aalayam. Again, thank you for all your insightful comments and kind words. It is much appreciated. So, keep them coming. I am going to sign off for the year soon with my ABSOLUTE favorite post! My Christmas post. I am taking you all home for the holidays next - please join me. For the holidays, you can't beat home, sweet home!" See you all in a few days at Home - virtually albeit! Deepa, Thank you again for contributing to this series...so many fabulous ideas! And thanks for the amazing mention in this post... its always such a pleasure collaborating with you! Lovely Ganesha in the first photo of this post. Enjoyed the post. Thank you Shalini. The feeling is mutual. Calindgirl: The ganesha was hand painted by a dear friend. Of course, the credit goes to the original artist (dont' know their name) but I found a picture on the internet and fell in love with it and my friend painted it to perfection for me. Imitation is the best form of flattery- I am sure the original artist would not mind their work being reproduced! Thanks for reading!